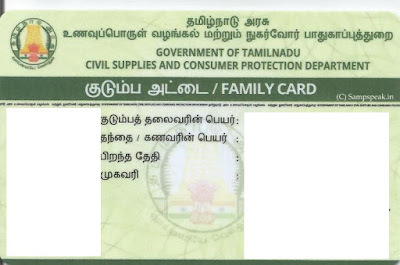 "Sampath Speaking" - the thoughts of an Insurer from Thiruvallikkeni: TN PDS goes digital ~ now Ration Cards are Smart cards !! TN PDS goes digital ~ now Ration Cards are Smart cards !! Do you know – what is the most valuable possession of ‘aamadmi’ – one that can get them food supplies, help in getting money credit from pawn brokers, serves as a proof of address, helps in establishing self as address proof, proof of income and much more – the great friend of poor and needy : ‘the ubiquitous Ration Card’. [and today I got my ration card converted in the form of small Smart card – there are some errors; yet, the initiative of the Govt. is laudable] ~ and it is totally in Tamil Only !! A smart card is a security token that has an embedded chip. Mostly in plastic, they connect to a reader either by direct physical contact (also known as chip and dip) or through a short-range wireless connectivity standard such as Near Field Communication (NFC). Mostly all chip cards are built from layers of differing materials, or substrates, that when brought together properly gives the card a specific life and functionality. The typical card today is made from PVC, Polyester or Polycarbonate. During the World War II India faced acute food shortages and to meet the exigencies a separate Food Department was established on 1st Dec 1942 under the Commerce Member of the Governor General’s Council. The Food Department was re-designated as Ministry of Food immediately after Independence. 1947. As per available records, the Directorate of Sugar and Vanaspati was part of Food Ministry in 1947. The Tamil Nadu Civil Supplies Corporation (colloq. Ration shop) is governed by Government of Tamil Nadu was established in the year 1956. It is responsible for providing food grains, commodities for the people under Public Distribution System through Ration shops. It also provides kerosene at very low cost besides providing rice, wheat, rava, sugar, cooking oil, even soaps. Public Distribution System (PDS) is a food security system, established by the Government of India under Ministry of Consumer Affairs, Food, and Public Distribution and managed jointly with state governments in India. A ration card holder should be given 35 kg of food grain as per the norms of PDS. ~ and the news is PDS will happen through smart cards from now on. In Tamil Nadu, the first batch of smart cards in lieu of existing ration cards are being issued. 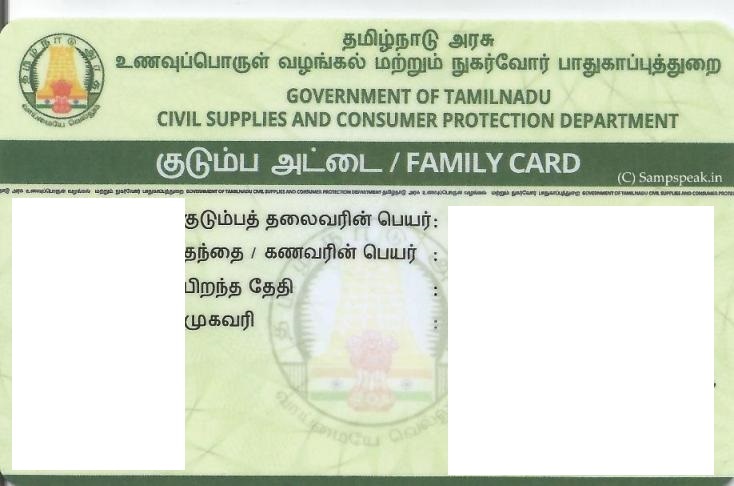 Using this electronic card, the card holder can get his/her grocery items from the Fair Price Shop's (FPS).The main reason for using this swipe card and making this process computerized is to remove the drawbacks of the present way of issuing products based on ration card. The main drawback in the current system is that the PDS has been criticised for its urban bias and its failure to serve the poorer sections of the population effectively. The targeted PDS is costly and gives rise to much corruption in the process of extricating the poor from those who are less needy. Also many retail shopkeepers have large number of bogus cards to sell food grains in the open market. Many FPS dealers resort to malpractice by diverting the farm produce procured by the FPS's to the open market. Ration cards in Tamil Nadu are all set to go fully digital with Chief Minister Mr Edappadi K Palaniswami launching a smart family card scheme to replace 1.89 crore cards in the state at a cost of Rs 330 crore. "Completion of distribution of smart cards has been planned to be done by May across the State," Palaniswami said after distributing the new cards to beneficiaries at a function here marking the launch of the scheme. The smart card is modified as smart ration card by coding the microprocessor chip present in it according to the requirements. Each smart ration card contains unique barcode. We need to collect the data from all the valid ration card holders and estimate the total number of smart ration cards to be created. The data includes details like no of members in family, names of the members, head of the family, permanent address, present living address, phone number, aadhar and more. The database will contain two different categories i.e. one for the card holder information and the other one to store the details of the items(products) that are being distributed. Consumers can continue to buy commodities at PDS outlets by using their existing ration cards till such time they received the smart cards, it is stated. Card holders can get the Smart cards at their respective PDS outlets after getting an SMS from the authorities, he said, adding a new data base has been created by getting the Aadhaar card details of ration card holders. According to the Press release, of the 6.90 crore members in ration cards, Aadhar details of about 5.85 crore persons have been collated. TN CM added that Rs 5,500 crore is being allocated annually for the Food department as subsidy. Have you turned smart already ? Miss USA Kara McCullough is a Scientist !! the tasty pulpy mango ~ the Yogi mango ! !